JES’ extraordinary voice, passionate song writing and legendary collaborations and with recent features in MTV Buzzworthy, Jungle Magazine, Cliché Magazine, Marie Claire and a place in Vibe Magazine’s “Top 10 Females in EDM 2013″ and featured in VMM Women of Dance feature all this has well and truly cemented her as one of the most recognized names in dance music today. JES’ new live show featuring sublime live vocals combined with her unquestionable mixing skills reaffirms a longstanding commitment to revolutionizing the EDM culture. The Unleash The Beat Mix show currently airs on more than 75 radio stations worldwide every week. 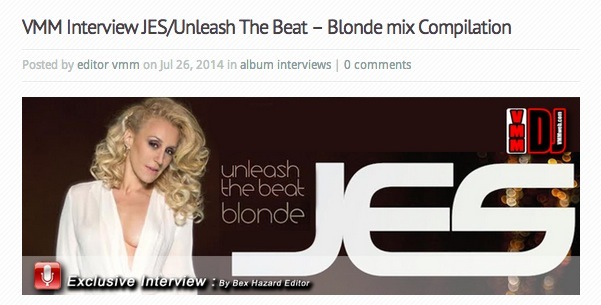 The VMM speaks to JES to find out all about the new compilation album named Unleash The Beat – Blonde Mix which is on release with Magik Muzik / Black Hole Recordings. The Interview: Hi JES, it is great to speak to you here again in the VMM and hope all is well with you on the launch of your new compilation album Unleash The Beat – Blonde.